The story came to me over the course of a year. We had a wonderful old dog named Carver (named after Raymond) who lost one of his legs to bone cancer. The vet said he probably had about 2-3 months to live, so I cleared my schedule and scaled back my work as much as I could to take care of him. Every day Carver and I would take long, slow walks. Most of the time we would only make it a block or two, with a lot of rest breaks. I spent this time daydreaming about the story. Carver lived for another 14 months, so by the time he passed away I had the town and characters and the beginning of the novel solidly in my mind. The first spark of the story came from a real-life experience. I entered an apple pie baking contest at a county fair on a whim. At the end of the day when I returned to the craft hall to see who had won, I found scores of bakers silently watching the judges eat pie in a glassed-in kitchen. The room was completely silent, the tension thick. I had had no idea that the contest was so competitive. For years I couldn’t shake the image of all of those bakers gathered around a glass wall. What are your influences apart from books? I have a great, great love of the movies. I would go to the movies every day if I could. One of my greatest influences is Frank Capra. I love how he could tackle bigger issues while weaving in comedy and romance. His movies are so human, and his characters are so wonderfully flawed. I’m always surprised when people talk about It’s a Wonderful Life as if it’s this saccharine story—it opens with a man considering suicide! It deals with sacrifice and loss and alcoholism and greed, and the way we can lose sight of what we have when we are focused on what we lack. Now, that is drama! And yes, it does have a sweetness to it, too. My biggest aspiration as a writer is to be able to write books like Frank Capra made movies. Many of the early reviews of The City Baker’s Guide to Country Living include food metaphors to describe your novel. Without mentioning food at all, how would you describe it? It’s the story of one woman’s search for belonging—to a person, to a place, to a community, to a family—and the joys and challenges she faces when she lets herself belong. It’s also about how our ideas about ourselves can shape our lives. Some people have described your novel as a guilty pleasure. What do you think about guilty pleasures? Do you have one? I’m not a big fan of books, or anything really, being called “guilty pleasures,” because I don’t think anyone should feel guilty about enjoying what they enjoy. I was raised a working-class kid in a very affluent suburb, and at an early age I developed a deep dislike for snobbery in any form. So if reading futuristic interspecies romance novels is your jam, I say read on! 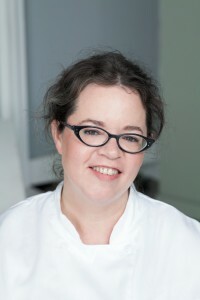 LOUISE MILLER is a writer and pastry chef living in Boston, MA. She is the author of The City Baker’s Guide To Country Living (Pamela Dorman Books/Viking). Louise is an art school dropout, an amateur flower gardener, an old-time banjo player, an obsessive moviegoer, and a champion of old dogs.